Hej, we are in Sweden. On the flight between Heathrow and Arlanda I sat next to a guy who appeared to be chewing snus. Snus (pronounced snoose) is more popular in Sweden than smoking and over ten percent of the men chew it. So I suspected he was Swedish. After a brief chat I learned that he was, indeed, from Stockholm. He taught me four words, please, thank you, hello and something else that I now forget. In fact, I only remembered two words, hello and thank you. And that was all we needed. Hello is Hej, pronounced Hey as in Hey dude, only without the dude part. Thank you is Tak pronounced tuck rhymes with luck. So I approach people and say Hey, pause, "Do you speak English" and they do. The Swedes switch over to English as quick as you please, without batting an eye, very little accent, very fluent. It is so smooth. I am amazed at their grasp of English and of ordinary phrasal verbs and slang. They say it is because anything in English like tv shows or movies, are broadcast in English with Swedish subtitles. This would include cartoons, so kids pick up the English. We arrived in Stockholm at 825 pm, and found our way to the central station by bus, then took the subway system to the appropriate stop for our bed and breakfast. We took a few minor wrong turns but by eleven pm we were standing outside an apartment building, arguing mildly when a man and dog came out. Petra, our hostess, had emailed that her brother was going to meet us at the apartment so I took a chance, "Hej, do you know Petra?" I asked and what do you know, this is Petra's brother. We are at the right place. So up we go to the large apartment and he shows us our room and the two common area bathrooms and explains that Petra is in Paris so she asked him to look after us as her husband is a taxi driver and works nights. This bed and breakfast is through Airbnb, I booked two nights a long time ago, about seventy seven Canadian dollars a night which, for Stockholm, is very reasonable. Well, it wasn't the welcome I had imagined before I learned that Petra would not be home, a warm hug, coffee and fresh cinnamon buns in a cozy kitchen, talking about cats and gardening. But her brother Hagar was very lively, talking a mile a minute with a Swedish-American accent. He told us he loved Jesus right off the bat. What do you figure, in a country where ten percent of the population go to church and most of them are Lutheran, what are the odds? He explained that he had been in Scientology, seems to have been a falling out, that he drinks a lot of special water that has the PH balanced, look, they have a machine. Over the course of two hours we heard a lot about water along with other tidbits such as the special water had cured him from drinking alcohol so now all he did was speed and prescriptions. I suggested he should try using the water to get off speed and he was enthusiastic about the idea. Finally, after consuming about five glasses of the water, it was good and seemed to make me thirsty, I retreated to the bedroom which was right off the kitchen. We had travelled five thousand kilometres over fifteen hours, including the three hour layover in London. Hagar and Jeff went to the living room so they wouldn't disturb me and the sound was somewhat muffled after that. Jeff begged off after another hour and then during the night got lost on his way from the bathroom and ended up sleeping on the living room couch til I woke him in the morning. What are you doing here? Well, they must think we are kind of weird as well!! During the night I was thinking, maybe there was no Petra. Maybe Hagar was a psychopath and he lured people to a bed and breakfast with a picture of a pleasant middle aged woman who looked like she baked and made good coffee. Maybe the water was spiked and we were going to be drugged, murdered, and disappear forever. In the morning light the apartment was large and cheerful, even though Jeff did run into Hagar in his speedo underwear in the kitchen at 830 am, but he was only getting another glass of water and went back to bed. No sign of breakfast. Jeff to mom - Let's get out of here. We were tripping over each other to get out before anybody else woke up so started our day at nine am. The day is sunny, we buy a twenty four hour transit pass and off we go to Gamla Stan (old town). The subway system is easy to follow. We walk around the old town, admiring the narrow, twisty, cobbled streets, the tiny shops and cafes, the people. There are still lots of tourists, but families are out as well, pushing prams, walking dogs. Most of the streets are pedestrian only, and we noticed wherever we walked that pedestrians had the right of way. On the main sidewalks there are bicycle lanes and lots of people are riding bikes, even though it is definitely fall weather. 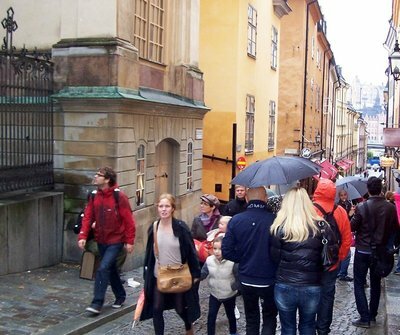 Gamla Stan, the cobbled, medieval section of Stockholm, dates back to the thirteenth century. The narrowest alley is less than a meter wide. The main square is called Storgorget. 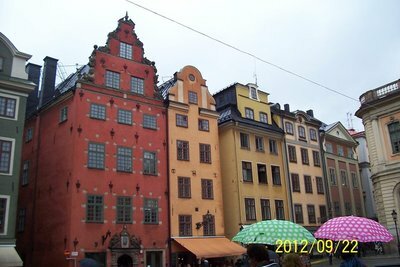 The Nobel Museum, the Royal Palace and Stockholm Cathedral are located in Gamla Stan. We paid six dollars Canadian for a coffee in the old town so that we could hook up to Wifi and the wifie didn't work so that was disappointing. While we were there a beggar came in and very quietly asked for money, good English too. People are so quiet here, even the beggars are quiet. A lot of them are out on the street kneeling, with their head on the ground, a money dish right in front of their forehead. I shouldn't say a lot, there were only about three that I noticed as we walked around the old town and the newer shopping area. I have my Blackberry Playbook along, it works as both a camera and a computer and is small. We have no cell phone. After a time we end up going to MacDonalds, yes, that is bad, but they do have free wifi and coffee was cheaper. The MacDonalds is packed, but we can still sit and talk, people talk quietly, laugh quietly, I swear to God the babies cry so softly you can barely hear them. I would have heard Jeff if he had whispered across the table. Stockholm is built on 14 islands, hence it is sometimes called the Venice of the North. We had been reading the outdoor posted menus, quite expensive, but we noticed at one establishment, a kind of nice restaurant/bar, that lunch was cheaper after one thirty. So we went there and enjoyed a salad bar, coffee, and Swedish Meatballs and lingonberries, satisfying and filling as there was also mashed potatoes. The coffee is strong and good. We have decided that we will eat one kind of authentic meal for sure in each country. Tick, we have done Sweden. Our twenty four hour transit pass included a boat ride to Skepsholm Island where the Museum of Modern Art and Architecture is located so we took the ferry over and enjoyed a nice walk looking at all the boats before going to the Architecture Museum which is free. 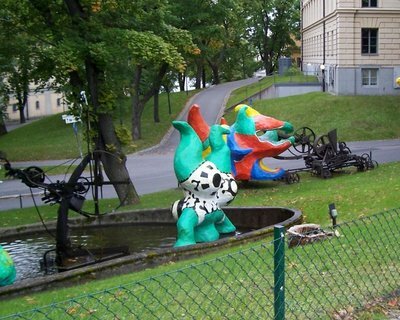 There was a fun outdoor park on Skepsholm Island with colourful, lifelike??? sculptures. We got back to our B and B after nine and Petra's husband was there, breakfast was laid out for the next morning, he chatted with us pleasantly until he had to go to work. 22 Sept - this is Saturday, we eat a good breakfast of dark bread, coffee, different cheeses, a tube of caviar which we didn't try, and then headed out with our packs which we put into a locker at the Central Station. We went to the changing of the guard. Note, check the schedule, it changes depending on the day of the week and the season. The royal palace has 1430 rooms, one of the largest in the world and is still in use as offices and for official meetings. The royal family does not actually live here. Following this free, about 40 minute event, we people watched, walked around Gamla Stan and eventually took a bus to the Viking Line Ferry - we are crossing to Finland overnight and have a cabin. I love Stockholm. The people are so polite. Nothing is noisy. The people appear animated, talking, visiting, but not shouting or screeching with laughter. When that happens it is likely a tourist and I notice that they seem to tone down to the environment. What an incredibly civilized place and how wonderful that we started our European tour here!! We have been to Norway and Denmark in the past but either of these countries would be a good starting off point as well. Starting here, it kind of eases us in, old buildings, unknown city, foreign language all around but easy to communicate in English from coffee shops to transit workers, they all speak English fluently and graciously. The money is the Swedish kroner. The medieval old town, the changing of the guard at the impressive royal palace, the canals, the "Venice of the North," all pale in comparison to the linguistic ability and civility of the Swedish people. Our time here was short but I will never regret visiting Stockholm.